حجم هذه المعاينة: 800 × 543 بكسل. الأبعاد الأخرى: 320 × 217 بكسل | 640 × 434 بكسل | 1٬024 × 695 بكسل | 1٬280 × 869 بكسل | 2٬400 × 1٬629 بكسل. 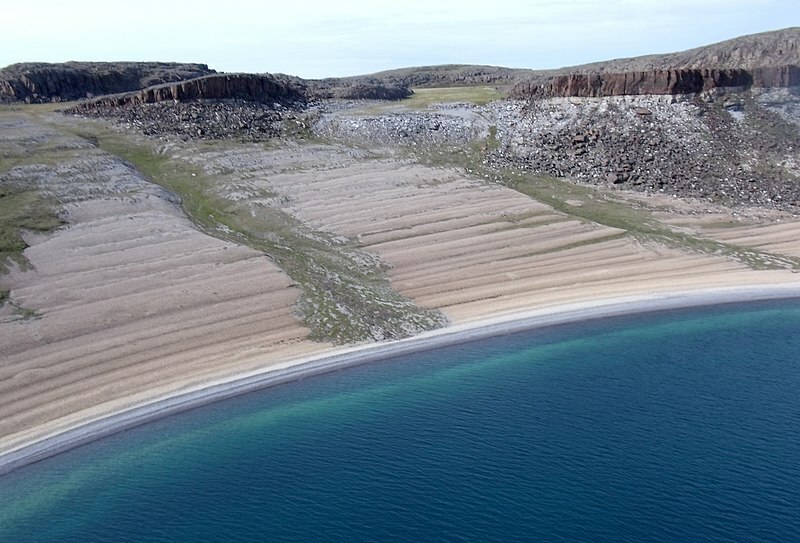 Many Coronation sills, part of the 723 million year old Franklin Igneous Magmatic Event, slice through the Earth's crust in the western Arctic of Nunavut. Here, at the entrance to Bathurst Inlet, an island-topping sill cuts through Proterozoic rock, a light-coloured carbonate formation in this case. The beautifully layered sand beach is caused by glacial rebound of the Arctic coastline during the current glacial interlude. Little to no tide hereabouts helped to form its layercake look. Isostatic rebound is still underway. تمت مراجعة هذه الصورة، المنشورة أصلا في فليكر، في 5 September 2013 بواسطة إداري أو مراجع File Upload Bot (Magnus Manske)، الذي أكد أنها كانت متاحة في فليكر تحت الترخيص المذكور في ذلك التاريخ.